H-A-P-P-Y N-E-W Y-E-A-R E-V-E-R-Y-O-N-E !!! I have been so ready for this to come for nearly the whole of 2016. It's finally here. What I adore about Hogmanay and New Year is the feeling of intention, wiping the slate clean and that with the turn of the clock hands you can do anything. People are friendlier at this time. Everyone tries to help their fellow human out more and you know, it feels really damn awesome to see this happening. So as the clock strikes into the first day of your clean slate, what do you plan to do with this opportunity? Make amends? Try something new and exciting or just try to be more organised? Making this change isn't a resolution. Even those who make no resolutions are somewhat making a resolution to not change. Starting afresh is never a bad thing and if you don't want to overwhelm yourself with things you 'must' do then why not just try to think more positively or to see each day as a new start? These are all achievable and you won't be left feeling like you need to beat yourself up if you 'fail' because there simply is no failure with these changes. 2017 is going to be a big one full of changes for me. But, I will start the year ready to take on whatever finds itself in my path. I feel strong. I feel confident and I am ready! Connor also has a lot of changes but he typically takes each day as it comes anyway so as a team - we can do this. And, we also resolved to travel. Ideally Hungry as my grandad was Hungarian and I weirdly have never been there. It's one of my bucket list must do's. I also plan to start driving lessons - at thirty-two, nearly thirty-three I don't feel daunted about it. Gutted I left it so late but then you're never too late to start anything that will benefit you in the long run, are you? 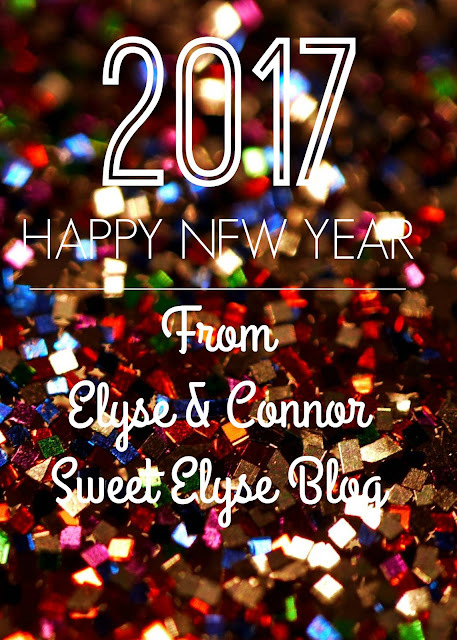 So from both Connor and myself, we wish each and every one of you a happy New Year. Sending love, hugs, hope and happiness to you all for 2017.